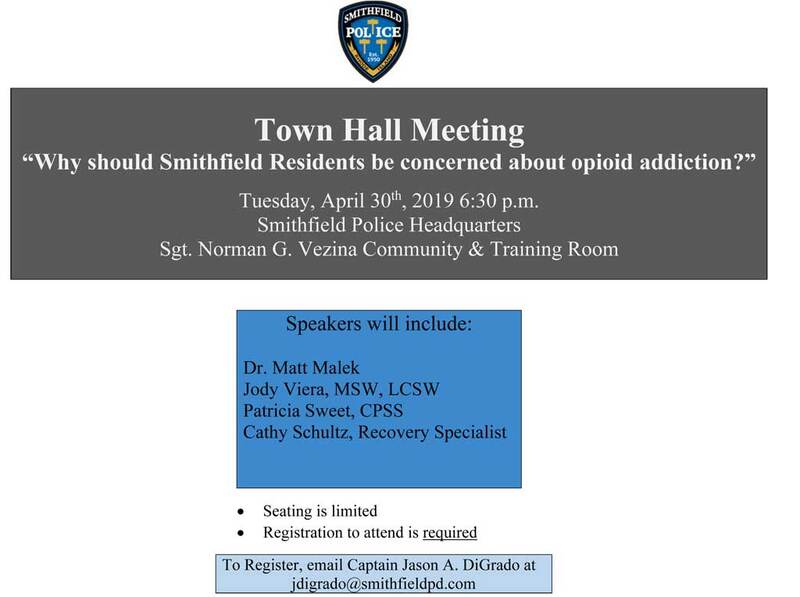 The Smithfield Police, in a cooperative effort with the Tri-County Southern Providence County Regional Prevention Coalition, are hosting a town hall meeting that addresses opioid addiction. There will be several different speakers covering various angles related to this topic. The purpose of this meeting is to inform residents that opioid addiction does impact the Smithfield community and that treatment is available for those in need. A resource table with brochures and literature relative to the opioid crisis, as well as Deterra ® (at-home, medication disposal) bags, will be available. At the end of the presentation, there will be a question and answer period offered to attendees. Representatives from the police department, fire department, and event speakers will be available for any questions relative to opioid addiction and its impact. This meeting will take place on Tuesday, April 30th, 2019, at 6:30 pm, in the Sgt. Norman G. Vezina Community & Training Room at Smithfield Police Department Headquarters, 215 Pleasant View Avenue. Seating for this event is limited. REGISTRATION IS REQUIRED. To register, email Captain Jason A. DiGrado at jdigrado@smithfieldpd.com. On Monday, April 8, 2019, at approximately 3:00 p.m., Smithfield Detectives arrested, Joseph Kasperzyk, age 19, of 155 Halper Avenue, New Haven, Ct., Zahir Williams, age 20, of 680 Beck Street, Bronx, NY and Shelton McNeal, age 20, of 1741 Washington Avenue, Lakeland, FL, all Bryant University Students, charging them with Breaking & Entering, Simple Assault, Disorderly Conduct and Conspiracy. Smithfield Officers received a call from Bryant Public Safety on Sunday, April 7th, at 2:00 a.m., regarding an assault that took place at Townhouse P-7. Smithfield Officers spoke to the townhouse residents, who advised they were woken up by subjects who had entered the townhouse and began banging on the bedroom doors, demanding that the occupants exit their rooms. Kasperzyk, Williams and McNeal then assaulted two of the residents, broke a TV, and tore posters off the walls. Kasperzyk, Williams and McNeal were taken into custody without incident and later appeared before Bail Commissioner Christopher Millea. All were released on $1000 surety bail. Their Pre Arraignment Conference date is July 8, 2019. The Smithfield Police continue to investigate this incident. March 29, 2019: Watch WPRI’s Steve Nielsen’s report with Det. Sgt. Gregg Catlow on the latest information. 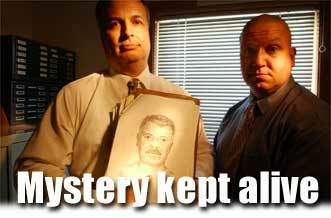 Please note that the following article from the Providence Journal is from 2003 – the case remains unsolved. REFUSING TO GIVE UP: Retired Smithfield police Detective Capt. Gregg L. Catlow, left, was the first to investigate the death of a man found floating in Stump Pond, Smithfield, in 1987. Capt. Kenneth A. Brown, right, is the latest officer to handle the case. Catlow holds an FBI sketch of the victim. Sixteen years after a weighted body riddled with stab wounds surfaced in a Smithfield pond, investigators are appealing for new clues to determine the man’s identity. SMITHFIELD — When the body was laid to rest, no one knew what name to chisel on the tombstone, and so today the short, slender man who floated to the surface of Stump Pond with 21 stab wounds 16 years ago lies in an unmarked grave, its location known only to the investigators who have kept his case alive. “We never closed the case. We just ran out of leads,” said Detective Sgt. Kenneth A. Brown Jr.
Gregg L. Catlow was the first detective to investigate the case. Over the intervening years Catlow rose to the rank of captain, and has since retired. The file he started is now several inches thick. Brown is the latest in the series of officers who have tried to puzzle through a maze of vague clues in search of an identity even as the calendar moves on. He’s optimistic, however. “Time is always on the side of the investigators,” he said. 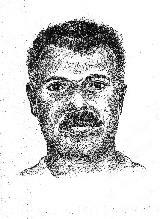 FBI sketch 1987 VICTIM: An FBI artist sketched the man’s face as he presumably appeared in life. One thing is for sure: Whoever last saw him didn’t want the body found. It was on June 18, 1987, on scenic Stump Pond, whose shore, ironically, is home to police headquarters, when a boater came across a decomposing corpse floating near a dam. The man was festooned in chicken wire and ballasted by 90 pounds of rocks and barbell weights, all fastened by coaxial cable. He had 7 wounds on his head, 14 on his chest. The weapon was thought to have been an ice pick or similar instrument. Anchored by the weights, he had presumably lain out of sight on the floor of the pond for one to three weeks, according to the state medical examiner’s office. As time went by, the gases of decomposition brought the body to the surface. Five feet, five inches tall, the mystery man weighed 122 pounds and had a scruffy beard. He was between 25 and 35 years of age. He had receding, straight hair, brown eyes and a brown mustache. A black muscle shirt bore the inscription “San Juan” on front and back. He was clad in gray sweatpants, and wore no socks under his size 7 1/2 McGregor Tristar sneakers. No tattoos adorned the body. There was neither wallet nor identification. There were no scars or jewelry. The police were looking at a blank slate. As new technology became available, it was employed at intervals in a bid to find a lead. DNA samples were available. But DNA, which was only just becoming a tool for criminologists when this man was killed, is useless unless it matches something already in a data bank. The DNA trail was a dead end. New advances in fingerprint identification were developed in the past 16 years by the FBI. A computerized system now makes it possible to examine fingerprint records across the country. But periodic checks have turned up nothing to provide a further clue to the man’s identity. Like DNA, fingerprints only work if they have been recorded previously. This John Doe evidently never came to the attention of law enforcement, the immigration system or the military, all of which are assiduous in collecting fingerprints. Because the body was gruesomely decomposed, Smithfield investigators turned to an FBI artist, who sketched the man’s face as he presumably appeared in life. Flyers were distributed. No response. Brown said he decided to try again because so much time was passing, and the chances for a connection were slipping away. He decided to appeal to the media, he said, before time erases all opportunity. If the case fails to yield to Brown’s persistence, it presumably will pass into the hands of his successor. If so, the trail can only grow longer, and likely colder. Capt. Michael Rheaume at 401-231-2500 or e-mail mrheaume@smithfieldpd.com. But check back later as they will be posted here when available. On Sunday, February 24, 2019, at approximately 5:38 p.m., members of the Smithfield Police arrested Trey Pinkerton, age 24, of 12 Nickerson Street, Providence; Eric Diaz, age 25, of 4 Young Avenue, Providence; Edwin Hernandez, age 23, of 4 Balsam Street, Cranston; and Romelo Thompson, age 22, of 75 Comstock Avenue, Providence, charging them with Possession with intent to Deliver Alprazolam, Possession with intent to Deliver Marijuana, Attempted Breaking & Entering, Driving without Consent of Owner, Driving while in Possession of a Controlled Substance, Possession of Marijuana and Conspiracy. Smithfield Officers received a call from the home owner at 27 Concord Street, advising there were several subjects in his yard and on his rear deck. The home owner gave a description of the suspects and the vehicle they left in. Smithfield Officers stopped the vehicle matching the description on Willow Road. Officers took the suspects into custody, without incident. The vehicle, which was stolen out of New Jersey, was searched by Smithfield K-9, Ajax, and 6.572 oz. of marijuana and sixteen 2mg pills of Alprazolam (Xanax), were located in the center console. Officers also checked the Concord Street residence and found that the screen on the rear deck slider had been opened. Pinkerton, Diaz, Hernandez and Thompson were held overnight and later appeared in Kent County District Court before the Honorable Magistrate J. Patrick O’Neill. Pinkerton and Thompson were held without bail as Superior Court Violators, and bail was set at $10,000 surety on the Smithfield charges. Hernandez and Diaz’s bail was set at $10,000 surety. Their Pre Arraignment Conference date is May 20, 2019. 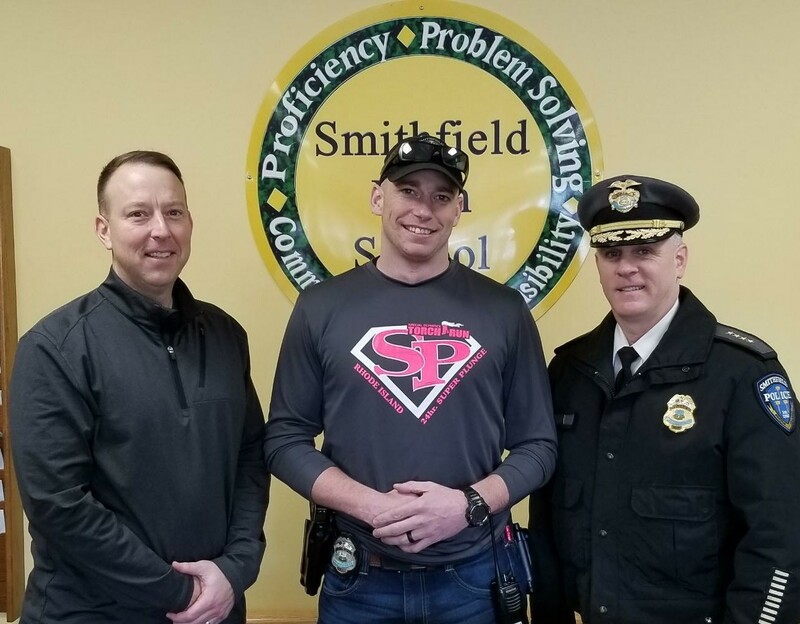 Today, Chief Richard St.Sauveur stopped by the Smithfield High School to thank School Resource Officer Jon Ricciarelli (middle) and Principal Dan Kelley (left) for their support of the upcoming Special Olympics Torch Run “Super Plunge,” as well as upcoming “unified” events at the Smithfield High School. To donate to the Ricciarelli’s efforts, as well as Special Olympics of RI, click on the following link https://www.firstgiving.com/fundraiser/jon-ricciarelli/Super-Plunge1. As always, please support “unified” sports & events in your community. The Rhode Island Chiefs of Police Secretaries Association (COPSA) will be offering a scholarship in the amount of $500 this year to be awarded in June, 2019. This one-time award will be given to a high school senior, or anyone possessing a GED, from any Rhode Island high school who has been accepted into a BUSINESS program and has a good scholastic average. If you have any questions, please contact one of the Scholarship Committee members: Lisa DiSciullo, Smithfield Police at lisa@smithfieldpd.com; Ginnie Bowry at gbowry@gmail.com; Lori Anderson, Johnston Police at Landerson656@yahoo.com; or Patricia Tweedie at ptweedie@cumberlandpolice.com. On Saturday, January 19, 2019, at approximately 11:55 pm, Smithfield Police responded to the area of Putnam Pike at Cedar Swamp Road for the report of a vehicle that struck a RI DOT snow plow and left the scene. As police arrived in the area, the suspect vehicle fled and continued westbound on Putnam Pike. Smithfield Police followed as the suspect vehicle turned onto Robert Street, which has no egress. Smithfield Police took custody of the male operator, but learned that the collision with the snow plow actually occurred in North Providence. The male operator did not have any identification, and the vehicle did not appear to be registered to him. The male operator refused to speak to police and would not identify himself. The male operator was transported to Smithfield Police headquarters to be processed on Smithfield charges, and for continued investigation. While at headquarters, and after obtaining assistance from the Rhode Island State Police, the Smithfield Police were able to identify the male as Jose Ruiz, age 36, of Cranston. Mr. Ruiz was then fingerprinted and further processed by the Smithfield Police. Smithfield Police were then contacted by Immigration Customs and Enforcement (ICE), who requested that Smithfield Police hold Mr. Ruiz due to a biometric confirmation showing that Mr. Ruiz lacked immigration status, and that Mr. Ruiz was considered removable under U.S. immigration law. ICE provided Smithfield Police with an Immigration Detainer Warrant and confirmed that Mr. Ruiz was removed from the United States in 2009 voluntarily with Safeguard. Mr. Ruiz appeared before Bail Commissioner Peter Hopkins and was arraigned on the following charges: Driving Under the influence of Liquor or Drugs 1st Offense BAC Unknown (31-27-2), Eluding a Law Enforcement Officer (31-27-4.1), Obstructing a Police Officer (11-32-1), and Driving Without a License 3rd Offense (31-11-18). Mr. Ruiz’s next scheduled court date is Tuesday, February 5, 2019. Mr. Ruiz was released from Smithfield Police headquarters and turned over to ICE Agents.